This week I am celebrating my 5th anniversary as Archbishop of Boston. It has been a very awesome responsibility that the Holy Father has entrusted to me. I am very grateful to all of the help and support on the part of our priests, laity, religious, deacons and friends of the Church who have made it possible for us to move forward in these very difficult times. This milestone coincides with our bicentennial year. 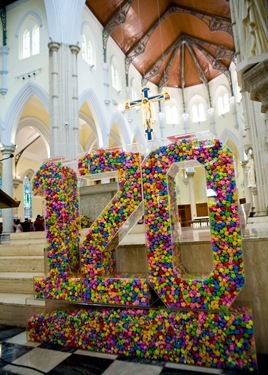 It’s a time for us to look back over the last two hundred years that have been filled with so many graces and blessings, with great growth and, although the last few years have been very painful and challenging, we know that God’s providence is always with us, guiding us and calling us to deepen our sense of conversion and commitment to the mission of that Christ has entrusted to us. There are still many challenges ahead and we count on the prayers and the cooperation of the Catholic community as we face our future with hope. If you are a regular blog reader, you know that in my last posts I’ve blogged on my experience at World Youth Day in Sydney, Australia. This week I thought you might like to hear about one of the groups of youth from our Archdiocese who had something of a unique experience. 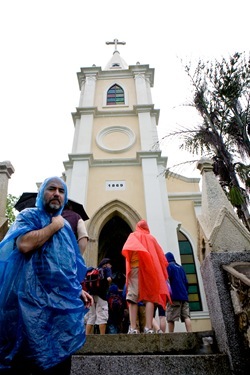 On their way to Sydney the youth passed through China and began their World Youth Day pilgrimage visiting churches and holy sites in the area, and proclaiming the Good News among the people they met. 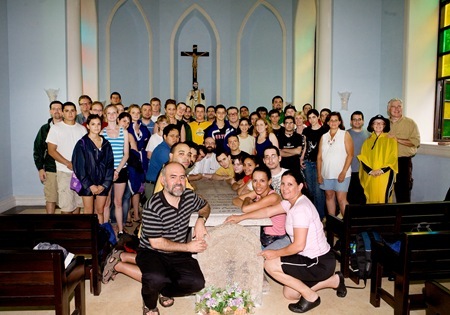 This week I have asked Father Tony Medeiros, rector of our Redemptoris Mater House of Formation, to share his reflections and photos of the trip with you. Together with a group of 50 young pilgrims and some adult chaperones from the various Neocatechumenal communities throughout the Archdiocese, we left Boston on July 9 to attend World Youth Day. As we usually do before beginning a pilgrimage, we held a Penance celebration for all the pilgrims and invited them to make a general confession of their sins. 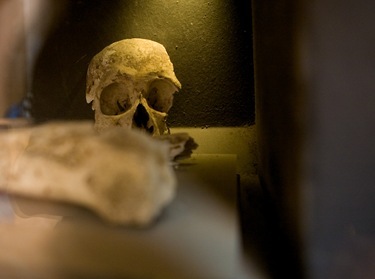 In the Middle Ages people would go on pilgrimages, sometimes out of devotion, sometimes as penance for their sins, and almost always they would come away from them having undergone profound conversion experiences. Some of them would die on the way and never reach their destination, and others would never make it back home. But for all of them, a pilgrimage would signal a new beginning for their lives, which helped us understand all the more why it was important to prepare ourselves well to receive the graces that God had in store for us during this pilgrimage. Even though there was a lot of preparation for this pilgrimage, we told the youth that God is the one that writes the script and that we cannot argue with God. This meant that there would be plenty of surprises from God but also difficulties that could easily make us grumble or lose heart. The difficulties started as soon as we left Boston. On our way to Sydney — and in order to help us live World Youth Day as a pilgrimage — we had hoped to fly first into Darwin, Northern Australia, and to spend a week there among Australia’s aboriginal populations, announcing the Gospel on the streets. 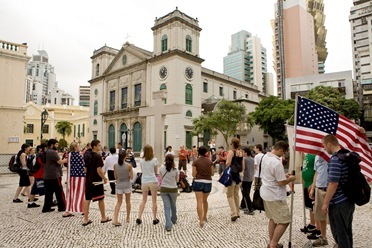 However, Divine Providence and the rising cost of airline tickets rerouted us to China and we ended up spending a week in Hong Kong and Macao before continuing on our way to Sydney. After flying for nearly 17 hours from Boston (via New York), we finally arrived in Hong Kong and when we went to collect our luggage we found that there were 18 bags missing. (Most of us eventually got our luggage within 3 days, but one girl just got hers this week, in Boston!) Since we had told the youth that we were in Hong Kong not as tourists, but as pilgrims, my first thought was that this pilgrimage must be something very important for all of us because it felt that, just as God would be with us opening the way for us, we should get ready also for “another one” who was already at work trying in any way possible to rob us of the graces of this pilgrimage. 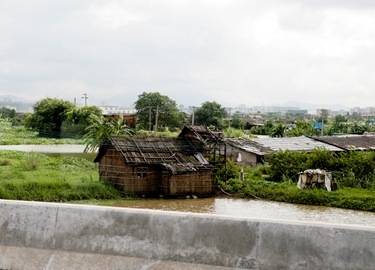 For me to return to this part of the world had a particularly special meaning, as it brought back many and fond memories of the time that God allowed me to spend there as a missionary. 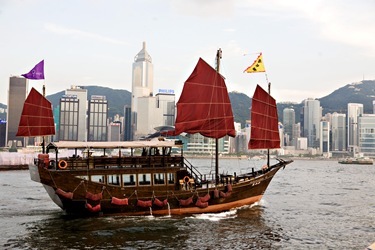 Today Hong Kong and Macao are mostly known for their vibrancy, fascinating cities teeming with people and constantly undergoing great changes. 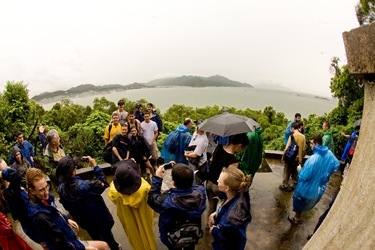 Yet, one of the less-known facts about this part of the world, and indeed our main reason for visiting Hong Kong and Macao, was to visit an island in the South China sea, called Shangchuan. 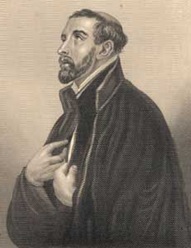 There, on the night of December 2, 1552, completely alone and suffering from a very high fever, St. Francis Xavier, patron saint of the Far East missions, died with his eyes fixed on China, even before he could ever set foot on the mainland. 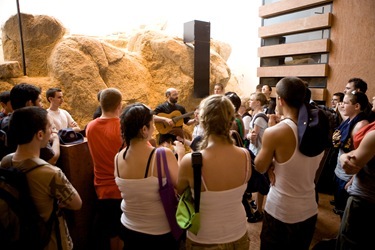 Although in the past I had been there with smaller groups of people, I had no idea about going there with a group of 50 people. 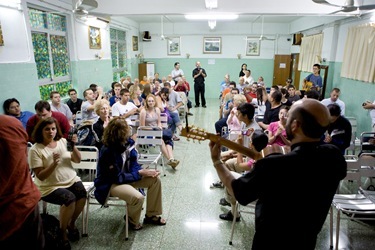 What I knew, though, was something that has stayed with me forever, and that is that a visit to this place leaves impressed inside of you something of the spirit and the zeal that burned in the heart of St. Francis Xavier: a love for announcing the good news to everyone, especially as difficulties increase and make the mission all the more difficult. No doubt there would be other graces for going there, but I was hoping that we all would receive this one. 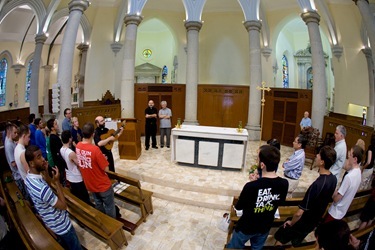 In Macao we began our pilgrimage with a visit to the local Bishop, Msgr. Joseph Lai, to hear a word from him and to receive his blessing. He is a first generation convert, the second only in his family to receive baptism after his eldest sister converted to the faith. 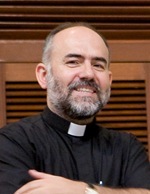 I remember him when he was the pastor of the Cathedral before and was happy to see him again as a humble and modest man, ever attentive to the guidance of the Holy Spirit. Like the previous bishop, he too shares the concern for the lack of vocations to the priesthood and for the need that the Church has to give witness of the faith in front of the pagan world. 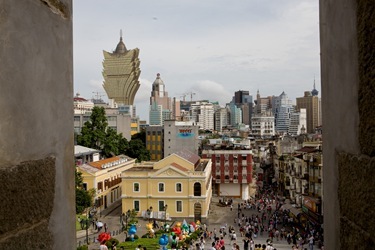 Although Macao today has lost some of its importance with the passing of time, historically it is one of the most important dioceses in the evangelization of the Far Eastern world. 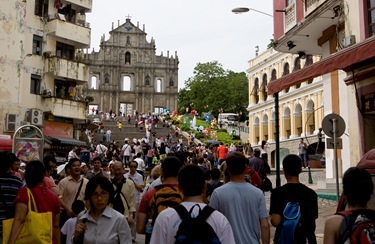 Not only did it give birth to more than 600 dioceses but from Macao missionaries departed all the way from India to Japan to announce the Gospel and to establish the Church in all these places. 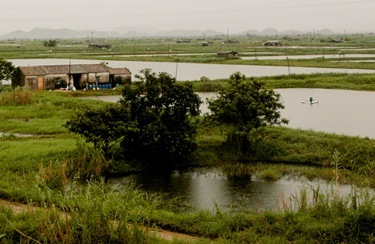 The impact of the Church’s presence as well as the tireless work of missionaries is easily seen all over the territory. 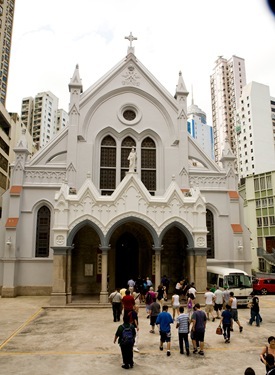 There are beautiful churches that the government has helped to preserve, both as reminders of a time when many people in Macao were Catholic and also as signs of a glorious past in which Macao and the Church were the gateway for any kind of exchange between East and West. 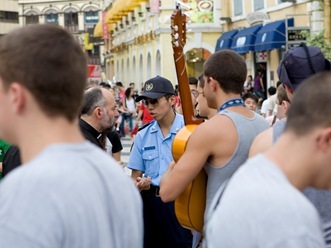 After visiting Bishop Lai, we began our mission in the streets of Macao. We gathered at the main square of the city, threw all our backpacks into a pile in the middle and formed a large circle around them. With the cantors playing their guitars in the middle, we all began to sing and dance around them. 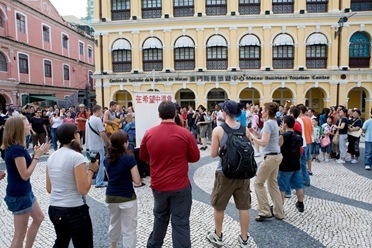 Soon people, many people, began to gather around us, Chinese and foreigners like us, some of them curious, others already clapping their hands to the beat of the songs, and still others joining us for the dance around the circle. Meanwhile some of us would engage the people and take advantage of their curiosity to talk to them, tell them who we were and, depending on their interest, announce to them a word of hope in the love of God. One man who stood by listening to us after a while told me, “This is very nice what you are doing” and another one asked if he could follow us to where we were going next to celebrate the Eucharist. 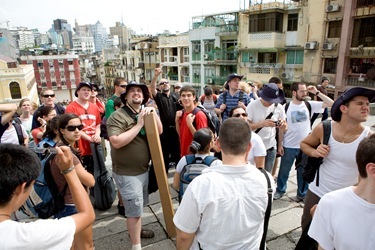 Then we opened and raised a banner that we had prepared with the words “In hope we are saved”, both in English and Chinese, and it took less than five minutes for the police to rush right over to us, ask us for the permit to sing there and, when they realized that we had none, tell us to leave the area. As they sent us away, the youth spontaneously joined in a roaring applause while some of them even asked the police to have their picture taken with them. 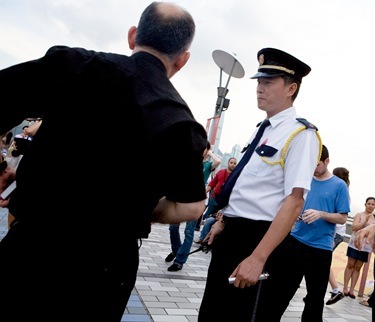 As it turned out, this was only the first time of a rite that would repeat itself many times during the course of our stay in China. Usually when the police would tell us that we had to go, we would move on to another place until another policeman came and told us that we had to go. I don’t know what an impact we had on the people listening to us, but one thing that I can say for sure is that the morale and the joy of the youth grew with each time that the police sent us away! 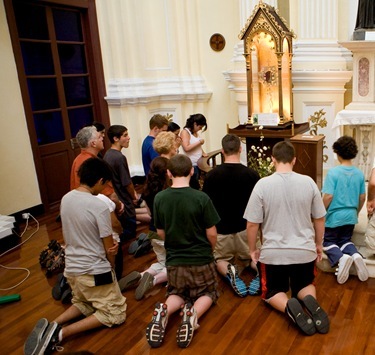 Since part of the scope of our pilgrimage was to help the youth discover their vocation, we tried to expose them to the different realities of missionary and religious work in the Church. Thus, we visited a house for the elderly run by a Spanish order of nuns and asked one of them to share her experience of the mission. Years ago, I had visited some of their houses and had been impressed, not just by the peace and generosity of these women, but especially by the joy in the face of the elderly. This time we went with all the youth and it was the same. 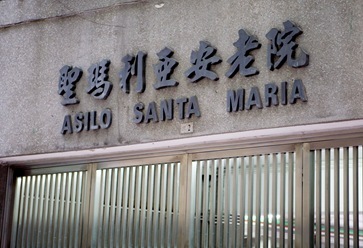 The young nun told us that she was a teacher by training and that when she arrived in Macao she was convinced that teaching is what she would be doing. Instead she found herself in this house that cared for old men, “not women, but men!” She said that for the first six months after she arrived she couldn’t even touch anyone there, let alone bathe the elderly. She would go to bed every night crying, thinking that she had made a mistake in her vocation or that God had made a mistake in her life. Finally one night, when she was asking God for help, she clearly saw that in the old men that she was refusing to touch or to bathe she was really rejecting Jesus Christ. 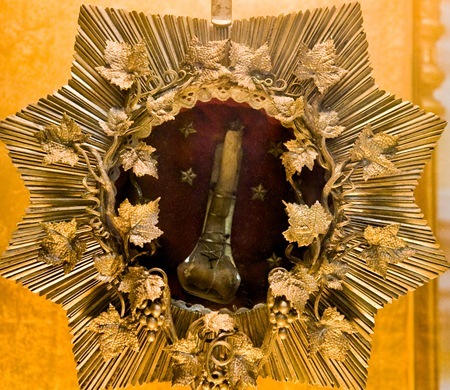 “And now”, she said, “every day I see the face of Jesus Christ in them”. She said that from that day onwards she never cried again! Technically, the elderly need to demonstrate to the nuns that they have no one else to care for them in order to be admitted in the house. However, the superior told us, sometimes people cheat them and lie to them just to get into the house. Later on, the nuns find out that some of them in fact have relatives who just don’t want to care for them, so they dump them there. 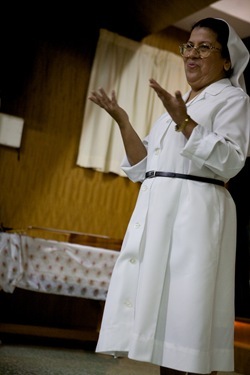 An interesting detail that the mother superior told about the people in the house is that they are all baptized. She said that when they arrive, they are all pagan; yet, after a year or so of being there, all of them ask to receive baptism so that today all the elderly living in the house are Catholic. Seeing the joy in the faces of the elderly, it’s no wonder that people try to deceive the nuns to have them care for their elderly relatives! Another place we visited in Macao was the Matteo Ricci Institute. 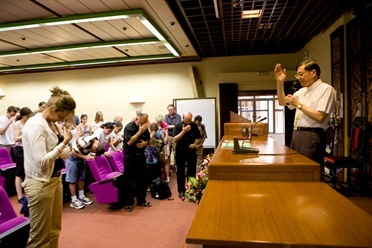 Scholars who study China and the relations with the outside world know of the importance that this Italian Jesuit missionary, who died and was buried in Beijing in 1611, had for the future cultural and religious exchange between the Middle Kingdom and the outside world. After spending only about 11 years as a scientist, astrologist and adviser to the emperor of China, Matteo Ricci remains the only foreigner to this day to receive the highest honors ever awarded by the Chinese nation to a foreign born person. 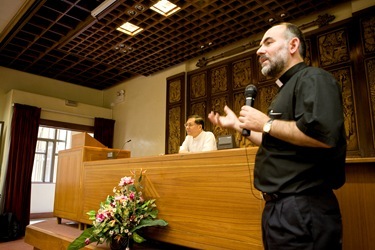 The meeting with the staff at the Institute was very informative not just about the person of Fr. 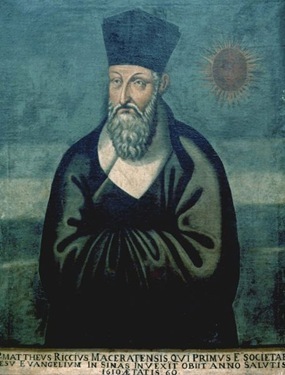 Matteo Ricci but also of other prominent historical figures that played a key role in the relationship between China and the rest of the world. 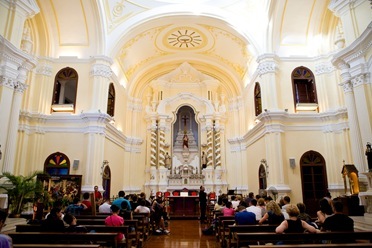 One of the most magnificent sights of Macao is the façade of the Church of St. Paul’s college. 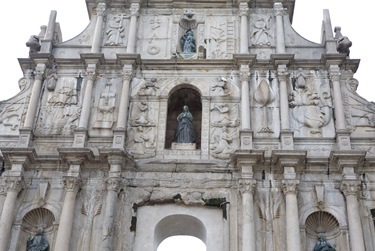 Built by the Jesuits initially in the XVI century and then rebuilt after being partially destroyed by a fire, the façade of the Church is all that still stands after it was yet again completely destroyed by another fire. 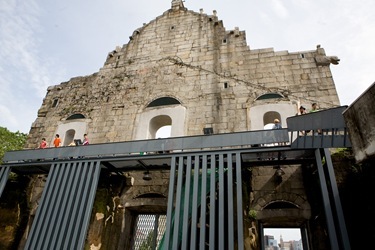 Known today as the “ruins of St. Paul”, the façade of the Church is the only thing that remains today of what had been the main center of formation and learning of the local languages for all missionaries before going to the missions. 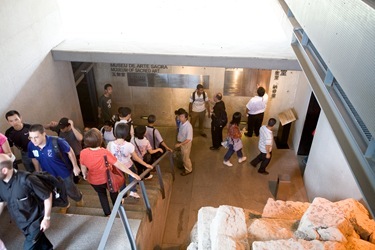 Behind the façade of the Church and below the ground, the Diocese of Macao built a crypt to house the bones of the Japanese and Korean martyrs who died during one of the persecutions. There we prayed the Psalms of Midday Prayer and sang the song “Shema, Israel!”, known also as the Creed of Israel. We felt that this song was appropriate because it confesses God as the only one in front of the many idols of the people, remembering those who loved God with all their strength and for whom “love of life did not deter them from death”. Another place that we visited in Macao was the chapel of St. Joseph’s seminary, where a relic of St. Francis Xavier’s right arm is venerated (the other half is at the Church of the Gesù in Rome). After being closed many years for restoration and only recently reopened, we were privileged to spend some time inside the chapel and to focus on the life and memory of St. Francis Xavier. 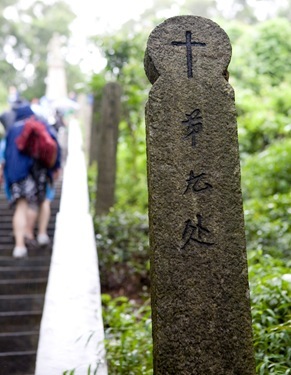 The following day we would cross into communist mainland China, and visit the island of Shangchuan where he died. 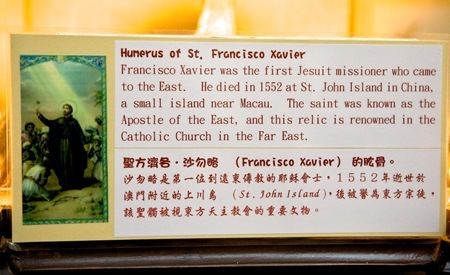 As I said before, Francis Xavier had been the guiding light and the reason why we came to China in the first place, so that being here began to feel as if we were following in his footsteps, kind of living out his dream of entering mainland China to announce the Gospel. On Saturday evening we joined the local Neocatechumenal community for the celebration of the Eucharist. Sunday started early for us. We needed to be on the other side of the border by 9:00 AM to catch the bus that would take us to the ferry into the island of Shangchuan. 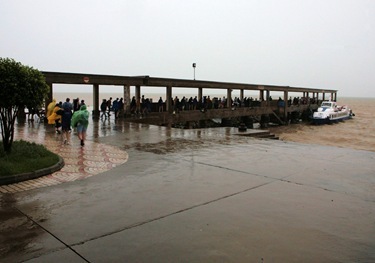 In addition to the usual steamy hot and humid weather, it was also raining, sometimes torrentially! In the bus we did morning prayer and read bits and pieces of the last letters written by St. Francis Xavier shortly before his death. 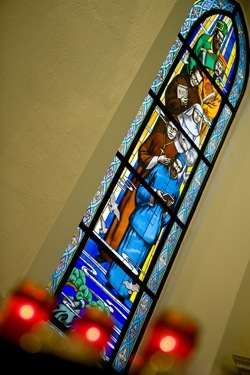 In spite of having undergone many trials and tribulations, St. Francis was convinced that he was nothing but ‘an impediment to the glory of God’ and, he who had requested St. Ignatius to send strong missionaries because of the hardships of the mission, was now convinced that anyone in his place would have done greater things than he did! Completely alone and at times fearing for his life, as the men whom he had contracted to take him into China (risking imprisonment and death if they were caught) could change their mind mid course and either kill him or dump him into the sea, Francis feared even more for the dangers that assailed his soul and the possibility that he could lose hope. At last we arrived at the little chapel housing the first burial place of St. Francis. Here we spoke of Francis’ life, of how he came from a noble and wealthy family and had given up everything to announce the Gospel. Suddenly we were brought to that moment in time, as we too had become witnesses not just of Francis’ feeble condition but also of his undying zeal to bring to the great Chinese people the divine inheritance of the Gospel. 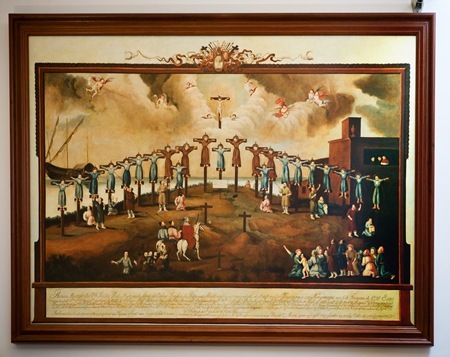 In a country both rich in cultural traditions and enslaved by the fear of the power of spirits, Francis had sought to give the Chinese people the liberating Good News of the Gospel, spending his life to the last to make sure that each of them received what was theirs by divine right and, that is, that in Christ and through baptism each of them truly was a child of God! 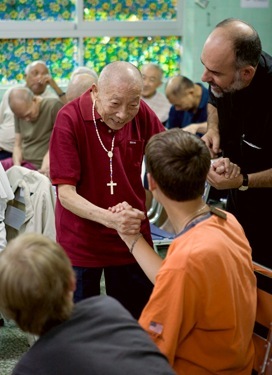 The next day, we left Macao for Hong Kong by ferry, where we were met by brothers from the local Neocatechumenal communities and then went to a meeting with Cardinal Joseph Zen. 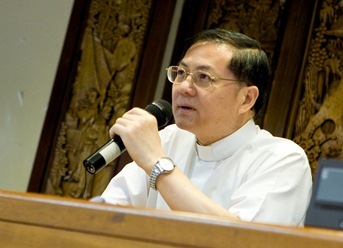 The cardinal spoke to us of his personal life and vocation, but also of the situation of the Church in China and the many hardships that Catholics endure daily to live out their faith. 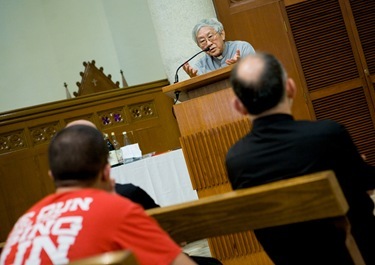 In telling us about his vocation, Cardinal Zen spoke of how his father had wanted to be a priest. 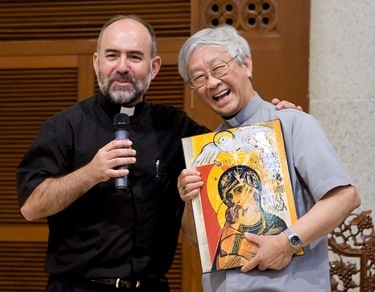 Cardinal Zen comes from Shanghai and his father, a first generation convert, had expressed his desire to become a priest to the Salesian missionaries who baptized him. Since in those years, the cardinal said, the Church discouraged new converts from becoming priests, the missionaries told his father to get married, form a Christian family, and pray that God would give him a son: his son would become a priest! “Well,” the cardinal said, “my father had to wait for a long time because I am the last in a family with 4 elder sisters.” Finally, when the much desired boy was born, his father wasted no time teaching him all the prayers that he had learned, taking him to Sunday Mass (sometimes to all five of them in a row) then bringing him to benediction in the afternoon, etc. 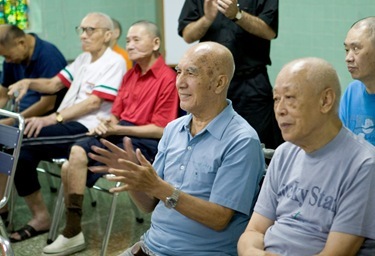 By the time he was a boy, the cardinal said, the Salesians had become his family. Today he is no doubt the most authoritative religious person in Hong Kong, admired equally by the faithful as well as non-believers who praise his courage as he occasionally reminds the government to respect the human dignity of every person above party politics. The three days in Hong Kong went by very fast. 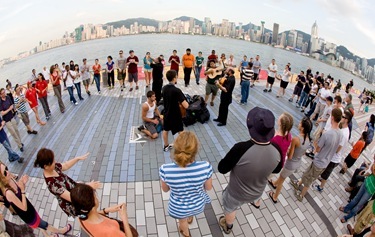 We continued our street mission as we had done in Macao — with similar results. Knowing something of the reality of the Church there, what impressed me the most is the perseverance of the local Christians who sometimes have to endure great hardship for their faith, not just from society in general, but often times from their own families. 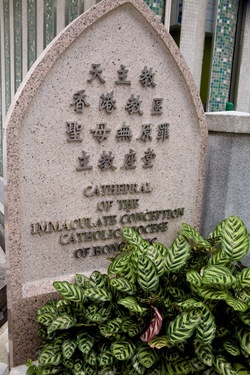 Cardinal Zen’s words to us, not to take our faith for granted, continue to echo inside of me, especially as many people in Hong Kong and all over China are despised and virtually ostracized by their families for becoming Christian and for abandoning the tradition of their ancestors. 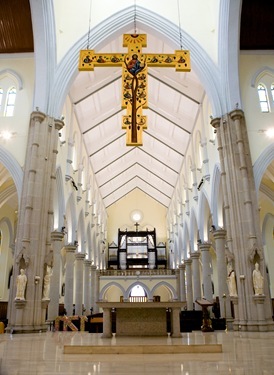 Of course, following our visit to China, we went on to Sydney where we celebrated the beautiful vigil and Mass with the Holy Father.